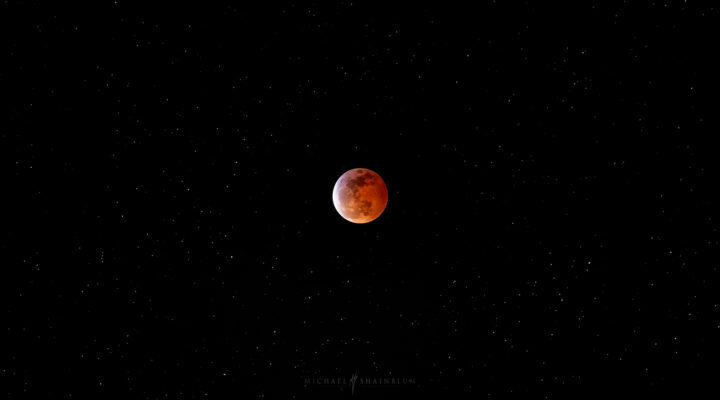 I had the opportunity to shoot the rare Super Blue Moon Lunar Eclipse this morning in San Francisco. It was quite a beautiful sight and I snapped two photos that I hope you enjoy! Here is the first image from the night. This is a single exposure taken with the Sony A7RII and Canon 70-200 lens. Settings for this shot were 2.0 seconds F4 ISO1000. For this photo I did some light color correction, noise reduction and sharpening. I love the way you can see the stars shine over the city as the moon goes into shadow. I was also surprised by the clarity of the stars, given how much light pollution exists in the San Francisco Bay Area. The second image is just a cropped view of the same photograph, so that you can see the detail in totality. To buy a print of this photograph, click here. 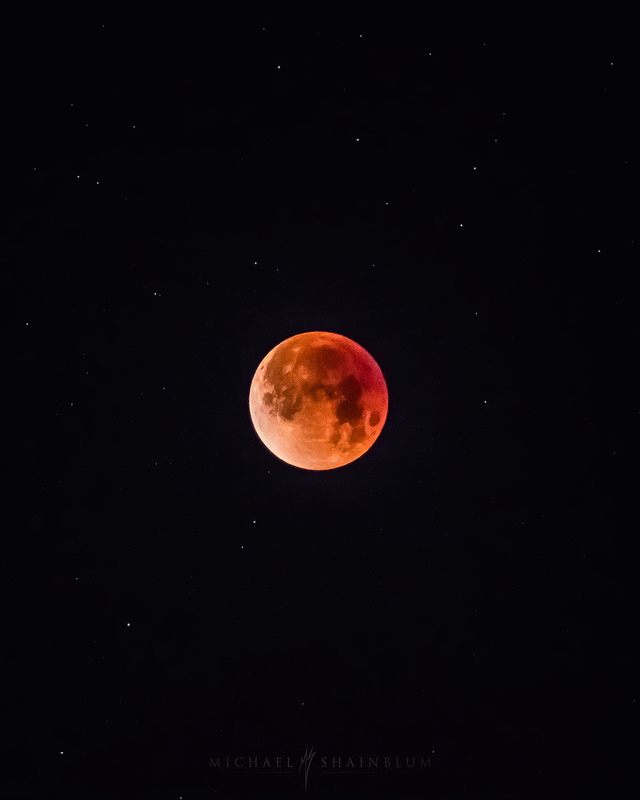 This photo is an even closer view of the moon during totality. Taken with my friend Raphy’s 600 millimeter lens. Which he generously allowed me to use for a shot. To buy a print of this photograph, click here. Overall this was a really wonderful event. I tried not to worry so much about getting a great shot and instead experienced the moment with some good people! Did you get a chance to see the eclipse? Let me know what your experience was like! Stunning photos Michael. 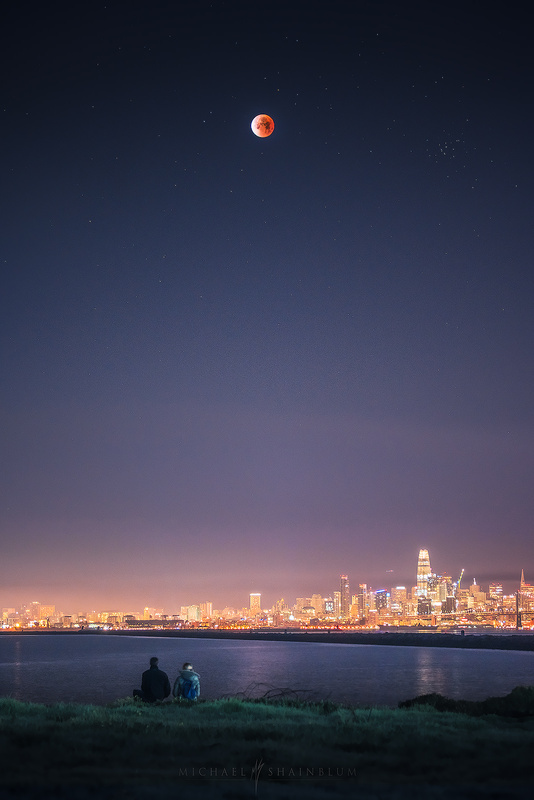 Out of all the photos I’ve seen from this event; your shot with the two people in the foreground, SF skyline in the background, and the blood moon in the sky is by far the coolest image I have seen. I’m always amazed at the quality of images you capture, especially during special events like this when you gotta be fairly quick to make sure you get the right shot. 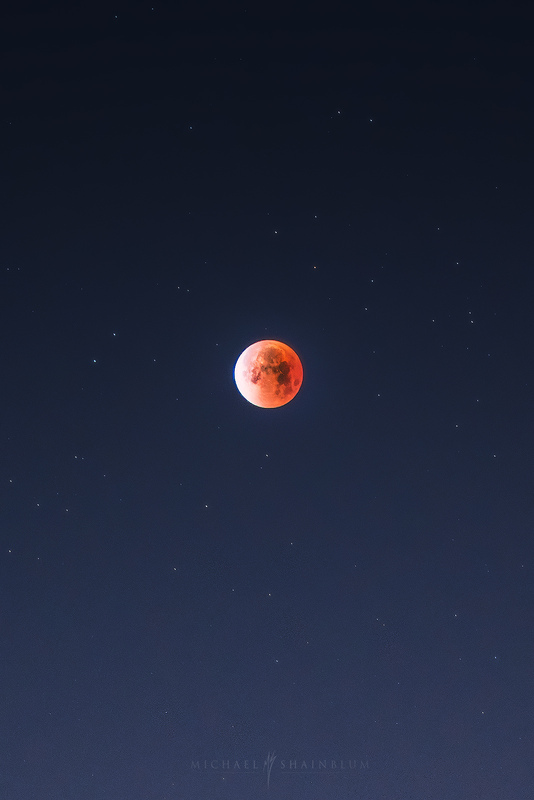 I managed to catch the moon during totality as well. It was such an amazing experience! I posted a tele shot to to my IG as soon as I could afterwards. Though I certainly wish I would have had my 400 with me instead of my 70-200. Thanks so much Zach! I hope the next eclipse is a little lower to the horizon, I plan to get a little more creative. Thank you for your shots and your insight. I decided to go last minute and did not do my homework so my settings weren’t as good as they should have been.. I used my 70-200mm f4 with my 1.4x on my Canon 6D, but thought that up to 6 seconds would work with no trails…wrong choice. I got better as the night went on, but mostly just enjoyed being out there with a friend and numerous others just to take in this event. Thanks for checking them out! In general I think the experience was the best part. Just hanging out making jokes with friends and enjoying the view. Thanks for posting this, I was wondering why my images were less than stellar, now I know. 🙂 Also yes, pleasure to watch it. Wow ! you are one gifted artist, do you eve intend or plan to visit India, you sure will have a plenty to satiate your creative urge. Keep up this great work going. You are awesome.